If the next County Executive and County Council want to prevent another Giant Tax Hike, they will have to do something that has not been done for years: seriously improve the county’s economy. Otherwise, no budget reforms will be enough to pay for the county’s needs. There are many ways to assess a local economy, but for the purposes of this column, let’s look at two big measures: jobs and income. From 2001 through 2016, the U.S. Bureau of Labor Statistics (BLS) calculates that total employment in the Washington metro area grew by 393,048 jobs, a growth rate of 14.6%. In Montgomery County, total employment grew by 14,086, a growth rate of 3.1%. 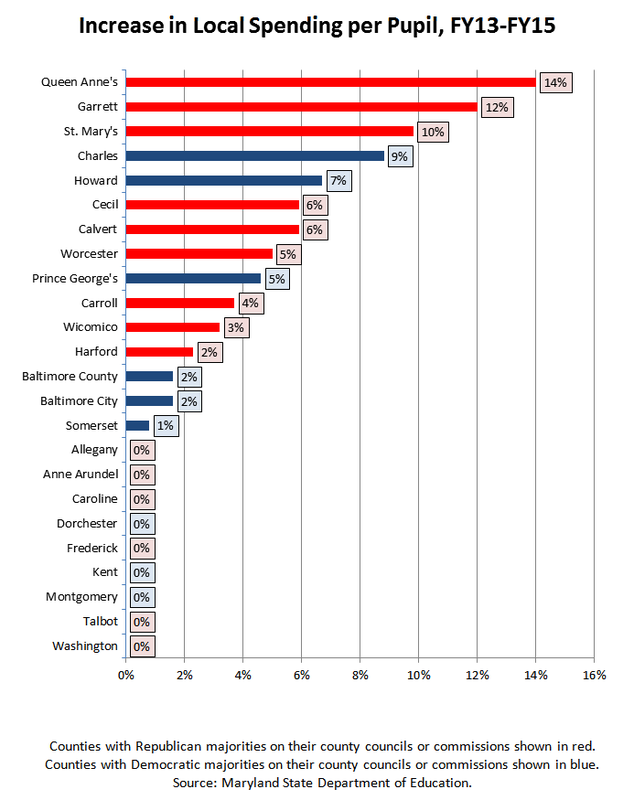 Of 24 local jurisdictions measured by BLS, Montgomery’s job performance ranked 20th. Among the large jurisdictions, only Prince George’s County fared worse. 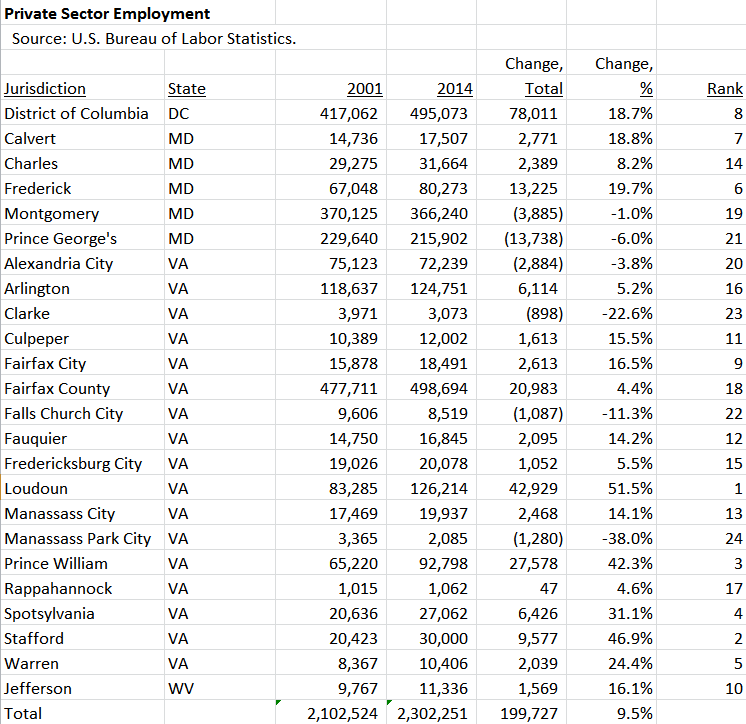 Montgomery fared well in federal employment over this period, growing its federal jobs base by 18.9%. That beat the metro area’s federal employment growth rate of 13.2%. The county’s employment problems are concentrated in its private sector, which grew by just 1.0% between 2001 and 2016. Montgomery’s private sector had 374,115 jobs in 2016, below its peak of 386,626 ten years before. Over the last fifteen years, Montgomery’s private sector employment growth ranked 19th of 24 local jurisdictions. 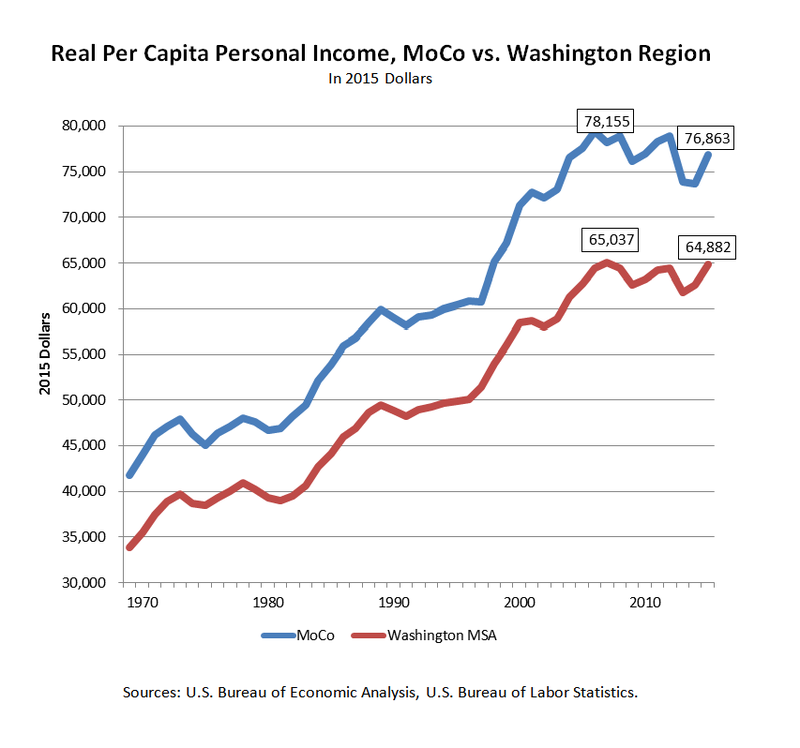 In terms of real per capita personal income, the Washington region enjoyed a long period of growth that peaked in 2007, the year before the Great Recession hit. In the eight years since, the region’s per capita income has struggled to increase for the first time in more than three decades. 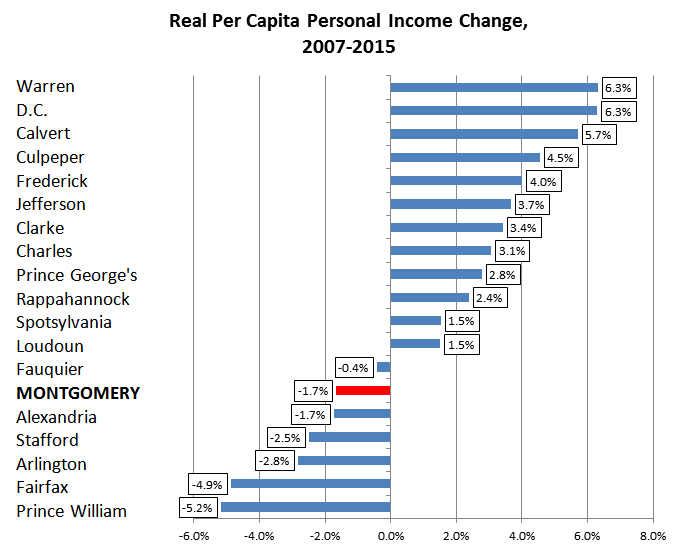 Montgomery has a higher per capita income than the regional average, but it has suffered from a similar pattern. Of 19 local jurisdictions tracked by the U.S. Bureau of Economic Analysis (BEA), twelve had real per capita personal income gains between 2007 and 2015. Montgomery was one of the seven jurisdictions that did not. Its 1.7% drop is below the regional total of -0.2% and ranks 14th of 19 jurisdictions in the region. 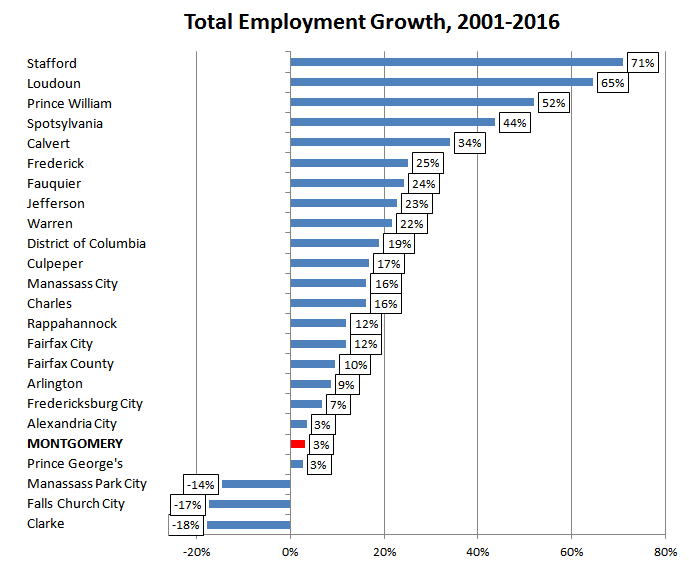 In broad terms, the employment data and the income data agree: Montgomery County has still not recovered from the Great Recession. The fragile state of the economy acts like a steel cage on the county’s budget. The county’s needs in public schools, public safety, transportation, health and human services and countless other areas will not go away. But unlike days past, the economy currently cannot generate the tax revenues to finance everything desired by those in office – and their constituents. The county has passed four tax hikes since the Great Recession started – two property tax increases (FY09 and FY16), an energy tax hike (FY11) and a recordation tax hike (FY16). Added to this is a series of recent laws imposing rising costs on employers. While some local jurisdictions in the region (especially in Virginia) have passed tax hikes and the District of Columbia and Prince George’s have passed new employment laws, Montgomery County is the only local government that has passed both in significant magnitude. There may be reason for that, but it has contributed to enormous competitive challenges for the county. Progressive policies such as those favored by Montgomery County politicians cost lots of money. That money can only be obtained over the long term through a robust economy. Economic growth is affected by the totality of what the county does – its investments in education and transportation, its fiscal and taxation policies, its planning decisions and the nature of new laws and regulations it imposes on employers. If any of these things negatively impacts economic growth, marketing programs, slogans and massive incentives for large businesses will not by themselves make up for it. The Number One lesson from the Giant Tax Hike is that the next generation of county elected officials must prioritize job creation and income growth. Failure to do so will result in more tax hikes and further long-term decline. Unfortunately for those Council Members who voted in its favor, last year’s 9% property tax hike won’t go away. The issue came up at the first County Executive forum, at which the three Council Members who voted for it defended it under heavy criticism from their Republican rival, Robin Ficker. It is sure to be mentioned again as several County Council candidates, including some Democrats, are openly wary of more tax hikes. And there is a general sense that the 40-point passage of term limits last year was driven at least partially by the tax increase. All local politicians have taken notice. There is no question that the Giant Tax Hike is widely unpopular, but it cannot be undone, so let’s learn from it. Next year, the county will have a new Executive and at least four new Council Members. All candidates taking office will assume responsibility for a county with needs that have not abated and a budget that remains challenging. What lessons can these new office holders learn from the Giant Tax Hike? In this series, we present three of them. Let’s start with Montgomery County Public Schools (MCPS). Tax hike supporters point to MCPS’s needs as a reason for the increase and they have a point. MCPS has enormous and permanent needs. The school system is a huge asset that requires continuous large investments to maintain. 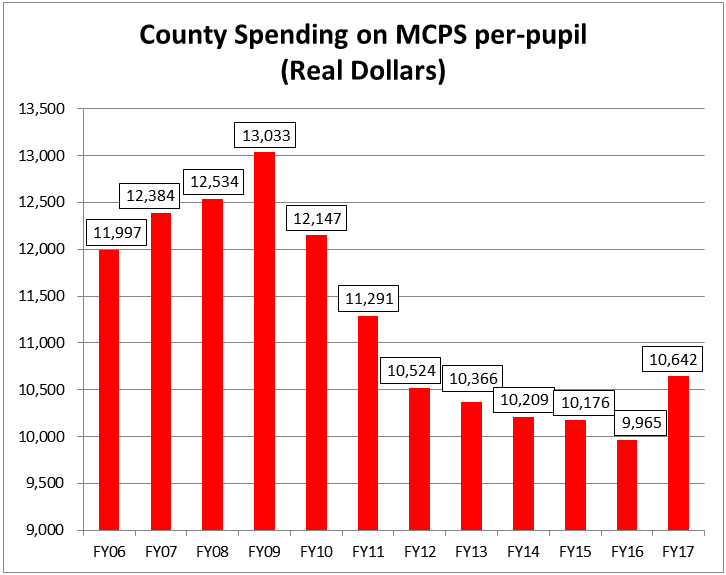 But while all of that is true, the sad fact is that the county imposed seven years of austerity on MCPS while lavishing double-digit increases on nearly every other function of government. Once MCPS’s problems became too large to ignore, then and only then was the tax hike passed. MCPS’s funding issues began when the Great Recession started impacting the county’s budget in 2009. The County Council has significant power to cut most parts of the budget but the school system is an exception. MCPS is covered by the state’s Maintenance of Effort (MOE) law, which establishes local per pupil contributions to school districts as a floor for funding levels in future years. The intent of the law is to prevent counties from supplanting state aid for schools by cutting their own local school funding and moving that money to other functions. Under the old MOE law, when a county wanted to cut its own local per pupil contribution, it needed a waiver from the State Board of Education or it would forfeit any increase in state aid for public schools. This penalty did not deter several counties from cutting local per pupil spending during the recession. In Montgomery’s case, the county cut its per pupil contribution three times. In FY10, the county’s cut was forgiven by legislation passed in the General Assembly. In FY11, the county obtained a waiver for a cut from the State Board of Education, who warned the county not to cut again. In FY12, the county cut its local per pupil contribution for a third time without even asking for a waiver. Egged on by the teachers union, the General Assembly got fed up and changed the MOE law. From now on, if a county tries to cut its per pupil contribution without a waiver, the state would send the county’s income tax revenues directly to its school system to make it whole. There would be no more messing around with MOE. This presented a budgetary challenge for counties. From now on, increases to local per pupil contributions would be almost locked in and very difficult to escape without the cooperation of local school boards. The new law was a risk factor that had to be managed. MoCo’s County Council reacted by freezing the county’s per pupil contribution for four straight years after three years of cuts. By FY16, the county’s per pupil contribution was $9,759 – well below the prior peak of $11,249 in FY09. Factoring in inflation, in real terms, the county’s per pupil investment in MCPS was 24% lower. That caused huge budgetary strain in the public schools. The budget was only one reason for the county’s behavior. There was also politics. Over the years, former Superintendent Jerry Weast had constructed a machine combining the school unions, the PTAs and the Washington Post editorial board to aid him in obtaining budget increases. Increasingly, the council viewed him as going too far. That perception became more acute when he held a meeting with union leaders at his home in 2008 and directed them to endorse Nancy Navarro in the District 4 special election. Further strains appeared when Weast threatened to sue the county over MOE and the council accused the school board of lying about its budgetary needs in Weast’s last year. Weast’s successor, Josh Starr, was caught in the aftermath. He was unlucky enough to serve during MCPS’s austerity years and the budget squeeze effectively sabotaged his tenure. While MCPS starved, the rest of the county government was well fed. 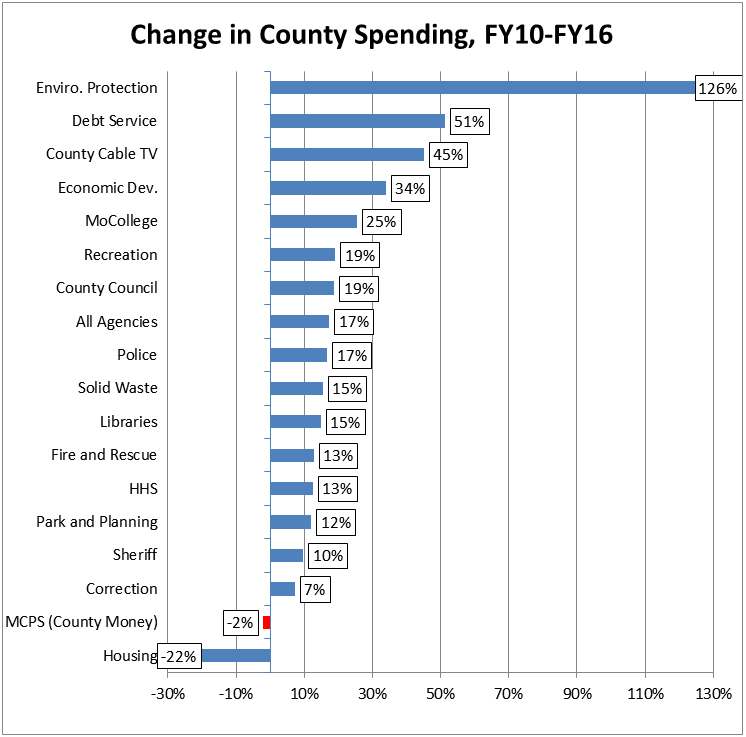 Between FY10 and FY16, the county cut local funding for MCPS but increased it by double digits for most other government functions. The police department, the fire department, the libraries and almost every other department recovered nicely from the recession. The council itself enjoyed a 19% increase for its own operations. MCPS was almost alone in austerity. (Housing had a significant decline only because of a one-time large expenditure to the Housing Investment Fund in FY10). 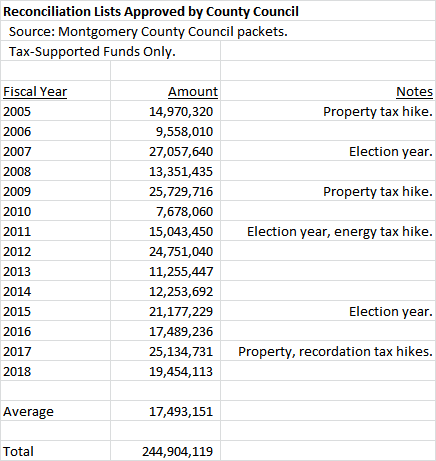 This profligacy throughout county government made it harder to afford an increase for MCPS without raising taxes later on. MCPS might have collapsed if it were not for state aid increases. 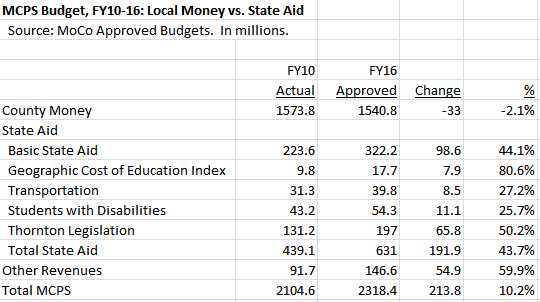 Over the FY10-16 period, the county cut local operating funds for the schools by $33 million, but state operating aid went up by $192 million. Meanwhile, many other counties reacted to the new MOE law differently. While MoCo froze its local per pupil contribution to its schools, fifteen other counties increased their contributions during the first three years of the new law. Nine of these counties were controlled by Republicans. That’s right, folks – supposedly progressive MoCo lagged Republican counties in increasing local support for schools. After seven years of squeezing MCPS, the county finally relented and increased its per pupil contribution, but it did so with a 9% property tax increase. And it wasn’t just the schools that got more money – once again, nearly every other department got a bump. There’s a lesson here for the next generation of county leaders. MOE does indeed present a risk for the county budget, but it’s a risk that can and should be managed. Seven years of austerity for MCPS cannot be imposed without major strains on public school operations. A far better approach is to implement small but steady increases to per pupil funding while moderating growth in the rest of the government to pay for it. That’s the best way to maintain one of the county’s greatest assets without imposing giant tax hikes. In Part Two, we will look at another lesson to be learned. The untold story about the Giant Tax Hike is that it could have been cut substantially while still maintaining every dime of funding for MCPS in the Executive’s recommended budget. How could that have been done? The Executive called for an increase in property taxes of $140 million over the charter limit. Three sources of savings were available to offset it. First, Senator Rich Madaleno’s state legislation enabling the county to extend the time necessary to pay tax refunds mandated by the U.S. Supreme Court’s Wynne decision freed up $33.7 million. Second, the County Council had obtained $4.1 million by not funding some elements of the employees’ collective bargaining agreements. Third, county agencies other than MCPS were due to receive a combined $36.3 million in extra tax-supported funds in the Executive’s recommended budget. Using some or all of that money for tax relief would have reduced the tax hike even more. If all of that money were redirected, the tax hike could have been cut in half with MCPS still getting the entire funding increase in the Executive’s budget. Instead, the council kept the entire 8.7% property tax hike and distributed $25 million of it throughout the entire county government, as well as its affiliated agencies and partner organizations. While MCPS may have undergone seven straight years of austerity, most of the other agencies and departments had already received double-digit increases over their pre-recession peak amounts. This new money was on top of those increases. While this is an “education first” budget, it isn’t an “education only” budget. As much as many people care about our outstanding school system, we know that others have different priorities. This budget is very much about those people as well. This budget provides a much-needed boost to police and fire and rescue services as we will be adding more police officers and firefighters and giving them the equipment they need to continue to make this one the safest counties in America. This budget is about libraries, recreation, parks, the safety net, Montgomery College, and transportation programs that help get people around this county better. This budget means that no matter where you live in the county, if you call an ambulance, you can count on a life-saving response time. Our police force will now be equipped with body cameras. Potholes will be filled, snow will be plowed, grass in parks and on playing fields will be mowed and trees will get planted in the right-of-way. While our unemployment rate has fallen steadily over the past couple of years, our newly privatized program for economic development promises an even better job market in the future. We are going to help new businesses in their early stages and hope they will remain here once they become successful. We are going to aggressively seek to get established businesses to relocate here and we are going to fight to keep the great businesses of all sizes that already call Montgomery County home. Our avid readers and researchers will appreciate the interim Wheaton Library and extended hours at several branches. And students will have better access to after-school enrichment programs. As Council President Floreen demonstrates above, this is not so much an Education First budget as it is an Everything First budget, with nearly every department and agency getting a piece of new tax revenues. Let’s compare what happened this year to what occurred in 2010. 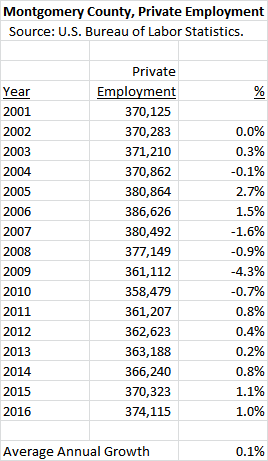 Back then, the county was suffering from the full effects of the Great Recession. Its reserves were dwindling to zero, revenues were in freefall and its AAA bond rating was on the verge of being downgraded. The County Council responded by passing a budget with furloughs, layoffs, no raises for employees, a cut in the county’s earned income tax credit, an absolute reduction in spending and a $110 million increase in the energy tax. Given the dire economic emergency, all options were bad ones, but the council really had no choice. The cuts and tax hike were forced upon them. This year, there is a stagnant economy (which we will discuss in Part Six) but no Great Recession. Reserves are substantial and have been on track to meet the county’s goal of ten percent of revenues. There is no threat to the bond rating. And yet, the council chose to pass a $140 million property tax increase – larger than the energy tax hike during the recession – when it could easily have reduced the tax increase, funded MCPS’s needs and not cut any other departments. But it did not. Like all big choices, this one will have consequences. We will explore them in Part Six. The tax hike is the part of the budget that is getting the most attention, but the County Council took another unusual step: it refused to fund part of the county employees’ collective bargaining agreements. Labor has taken notice. Salary increases in the county’s collective bargaining agreements are comprised of three main components. First, there is a general wage adjustment that all employees receive. Second, there is a service increment, also called a step increase, that employees who are not at the top of the salary scale for their classification receive. Third, there is a longevity increment that is received only by employees who are at the top of their scale and have completed twenty years of service. All of these items, along with many others, are negotiated by the three county employee unions (MCGEO, the Fire Fighters and the Police) and the Executive and codified in collective bargaining agreements. The agreements then go to the council, which can decide to fund all, some, or no items that create economic costs. During the Great Recession, the employees received no raises of any kind in Fiscal Years 2011, 2012 and 2013. Afterwards, the unions negotiated for and received general wage adjustments, steps and longevity increments as well as “make-up steps.” The latter were intended to compensate the employees for steps they did not receive during the recession. The unions won make-up steps in Fiscal Years 2014, 2015 and 2017 (this year’s budget) with the exception of the Fire Fighters this year. During these years, the combined general wage adjustments, steps and make-up steps ranged from 6.8% to 9.8% per year. This year, the council approved MCPS’s funding increase on the condition that some of the money scheduled to fund MCPS employees’ raises be instead redirected to hire teachers and other staff. The school board agreed. In order to maintain equity between MCPS employees and county employees, the council insisted that the county unions give up some of their raises and primarily targeted their make-up steps. The council refused to fund eight items in the collective bargaining agreements which together totaled $4.1 million in savings in Fiscal Year 2017, leaving the unions with raises of 4.5 percent. 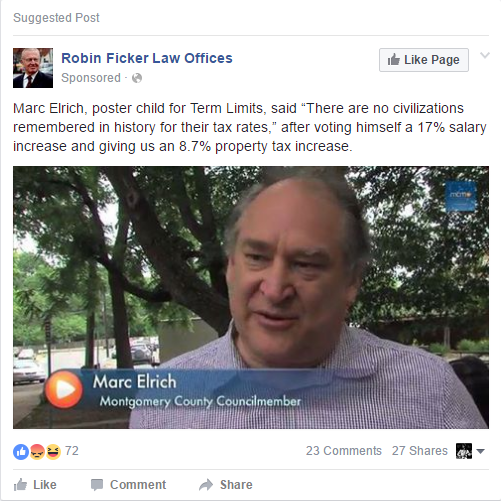 Only Council Member Marc Elrich voted with the unions. The county unions were outraged. MCGEO, the largest of them, published a scathing response on its website, blasting the council as “hypocrites” who engage in “public manipulation in order to achieve what looks like sound fiscal management while achieving nothing.” The council had approved make-up steps and total salary increases of 6.8-9.8% in both 2014 and 2015, so what had changed now? The difference is that few people were paying attention in those two years because a tax hike was not on the table. Now that a large tax hike was being considered, big raises were not politically feasible. Hence MCGEO’s anger. 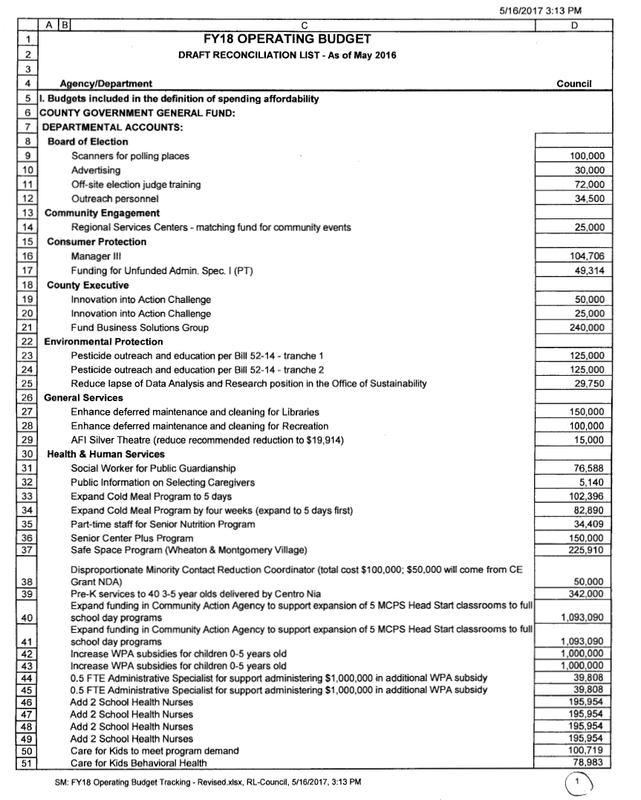 Justified or not, the council had achieved $4.1 million in savings by trimming employee salary increases. That money could have been used to reduce the property tax increase, but that’s not what happened. Why not? We will have more in Part Five. The need to fund MCPS was one reason given by county officials for their recent hike in property taxes. Another reason was the effects of the U.S. Supreme Court’s decision in the Comptroller of The Treasury of Maryland vs Wynne case. We examine that issue today. The Wynne case started when two Howard County residents with income from a firm that did business in other states applied for an income tax credit to offset their out-of-state earnings. While they received a credit against their state income taxes, they were denied a credit against their county income taxes. The residents sued, and the case made it all the way to the U.S. Supreme Court, where the court sided with the plaintiffs on a 5-4 vote. There were two consequences for local jurisdictions. First, they could no longer tax out-of-state income. Second, they owed refunds to residents who had paid taxes on out-of-state income dating back to 2006. Between the two changes, Montgomery County’s Department of Finance estimated lost county income tax revenue of $76.7 million in FY17 and FY18, $31.5 million in FY19, and $16.4 million annually after FY19. When the Executive sent the council his recommended budget in March, then-current state law required that Montgomery County pay an estimated $115 million in refunds and interest in nine quarterly installments stretching into FY19. The hit in FY17 was $50.4 million. But Montgomery County State Senator Rich Madaleno, Vice Chair of the Senate’s Budget and Taxation Committee, passed a state bill that extended the refund payment period out to FY24. This reduced the county’s immediate liability and the Executive responded by asking the council to reduce his recommended property tax hike from 3.9 cents to 2.1 cents per $100 of assesable base. Senator Madaleno’s legislation enabled the council to cut the Executive’s original $140 million tax hike by $33.7 million and still increase county funding for MCPS by $110 million. But the County Council did not take advantage of it. They increased property taxes by the Executive’s original amount anyway, a tax hike of 8.7 percent. Why did they do that? We will explore that question soon, but first we will examine another source of potential reductions in the tax hike: savings from collective bargaining agreements. The County Council is calling its recently passed budget an “Education First” budget since it included an increase above the state-required minimum level for Montgomery County Public Schools. Let’s evaluate that claim. The council and the school system have had strained relations for a decade. The problems began under former Superintendent Jerry Weast, who antagonized several Council Members with his hard-charging, overdriven style. Nevertheless, Weast won several major budget increases for MCPS during his tenure. Then came the Great Recession, which forced the county to make substantial spending cuts across all of its agencies. One obstacle to cuts at MCPS was the state’s Maintenance of Effort (MOE) law, which sets a local jurisdiction’s per-pupil contribution to public schools as a base which cannot be lowered in future years unless a waiver is obtained from the state’s Board of Education. 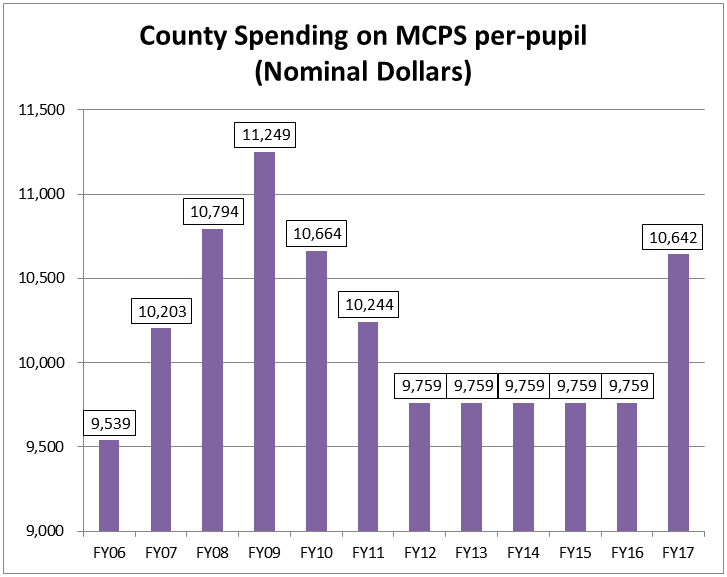 In Fiscal Years 2010, 2011 and 2012, the county cuts its per-pupil contribution to MCPS, and in 2012, it did so without applying for a waiver. As a result, the General Assembly changed the MOE law to force counties to apply for waivers or else have their income tax revenues sent directly to school systems. At the same time, the General Assembly shifted a portion of teacher pension funding responsibilities, once solely the province of the state, down to the counties. The combination of these two changes provoked outrage from county officials, some of whom vowed to never support a dime over MOE for MCPS in the future. The chart below, which shows the recent history of Montgomery County’s local per-pupil contribution to the schools, illustrates the effects of these events. After rising through FY09, the per-pupil contribution fell for three straight years and then was frozen for four straight years. This year, the Executive proposed and the council approved an increased per-pupil contribution. (Roughly $300 of the increase is accounted for by the county’s payment of teacher pensions.) This is why the County Council is calling its budget an “Education First” budget. But three items of context apply here. First, the above chart does not include the effects of inflation, which erode dollar contributions over time. The chart below shows per-pupil contributions in real dollars using 2017 as a base. (Inflation in 2016 and 2017 is assumed to be 2.1%, the average of 2007-2015.) Adjusted for inflation, the county’s current per-pupil funding is nowhere close to what it was before the Great Recession struck. Second, while MCPS was living under austerity, other county departments were receiving sizeable funding increases. The chart below compares funding increases across several county departments and agencies including MCPS between FY10 (the pre-recession peak year) and FY16. In terms of county dollars only, MCPS’s budget was cut from $1.57 billion to $1.54 billion over this period, a 2% cut, while many other departments enjoyed double-digit increases. Can one good year make up for seven years of austerity for the public schools? Third, while county officials criticize the General Assembly for tightening the MOE law and shifting teacher pensions, it is the state that has been pumping substantial funding increases into MCPS’s operating budget. The chart below shows that while county funding for MCPS was cut by $33 million between FY10 and FY16, state aid to MCPS rose by $192 million. The bottom line is that the new FY17 budget does add $110 million in local money to MCPS, an amount which exceeds the state-required maintenance of effort by $89 million. But this one funding increase comes after seven years of reduced and frozen per-pupil contributions, a period during which the rest of the government enjoyed double-digit increases. Council President Nancy Floreen has described the budget as “a historic partnership with the Board of Education” and “a plan for the future.” Does that mean that the council will continue to exceed maintenance of effort and give the school system increases that match the rest of the government in future years? Or will this be a one-year respite, after which austerity will return? We will have more in Part Three. As part of the Fiscal Year 2017 budget, the Montgomery County Council has voted to increase property taxes by 8.7 percent. This is a landmark event that is drawing attention from a large number of people who hold differing views. While it is a dramatic development, it is also the product of several factors that have been building for a number of years. This series will explore those factors, explain how it happened, and look at the future. First, a bit of background. Property taxes are the number one source of revenue for Montgomery County Government, as they are for most, if not all, county governments in Maryland and Virginia. In recent years, property taxes have accounted for 35-40% of the county’s total revenues, and the average household paid $4,154 in FY16. In 1978, the nationwide property tax revolt that produced Proposition 13 in California came to Maryland. That year, Prince George’s County voters passed the Tax Reform Initiative by Marylanders (TRIM) charter amendment, which placed a hard cap on property tax collections, and replaced it with a rate cap in 1984. A 1996 referendum to repeal the cap failed. Montgomery County voters also saw a TRIM charter amendment in 1978, but they voted it down by a 52-48% margin. In 1990, Montgomery civic activist Bob Denny authored a charter amendment limiting growth in property tax collections to the rate of inflation, and county voters passed it. But the charter amendment contained an override provision allowing the County Council to exceed the limit on a 7-2 vote. By the 2000s, the charter limit’s constraint on the council began to evaporate. The council voted to exceed the limit in FY03, FY04, FY05 and FY09, thereby prompting Robin Ficker to place one of his many anti-tax charter amendments on the ballot in 2008. After years of failure, the same general electorate that voted for Barack Obama for President by 45 points approved Ficker’s amendment by 5,060 votes. Ficker’s amendment did not convert the property tax limit to a hard cap, but it did require all nine Council Members to vote in favor of exceeding it. The council has not done that until this year’s budget. It’s worth understanding how Montgomery County’s charter limit works. Section 305 of the charter states the following. Unless approved by an affirmative vote of nine, not seven, Councilmembers, the Council shall not levy an ad valorem tax on real property to finance the budgets that will produce total revenue that exceeds the total revenue produced by the tax on real property in the preceding fiscal year plus a percentage of the previous year’s real property tax revenues that equals any increase in the Consumer Price Index as computed under this section. This limit does not apply to revenue from: (1) newly constructed property, (2) newly rezoned property, (3) property that, because of a change in state law, is assessed differently than it was assessed in the previous tax year, (4) property that has undergone a change in use, and (5) any development district tax used to fund capital improvement projects. This is not a cap on rates. It is a cap on collections, which are not allowed to grow faster than the rate of inflation with certain exceptions unless all nine Council Members vote to override. Collections are a product of both rates and assessments. If assessments grow rapidly, it’s possible for the county to cut the tax rate and still grow collections to the limit (or beyond). Conversely, if assessments fall, the rate could rise and collections might grow slowly (or even shrink). This distinction is key to understanding how the county makes decisions on this item. In the new FY17 budget, County Executive Ike Leggett proposed increasing the property tax rate by 3.94 cents per $100 of assessed real property, an increase of 8.7 percent that would have raised $140 million more than the charter limit. The Executive cited two main reasons for doing so: the challenge of dealing with the adverse consequences of the U.S. Supreme Court’s Wynne decision, which required large refunds to be paid to some county taxpayers, and the fiscal needs of the public schools. We will look at both of those items as this series continues.